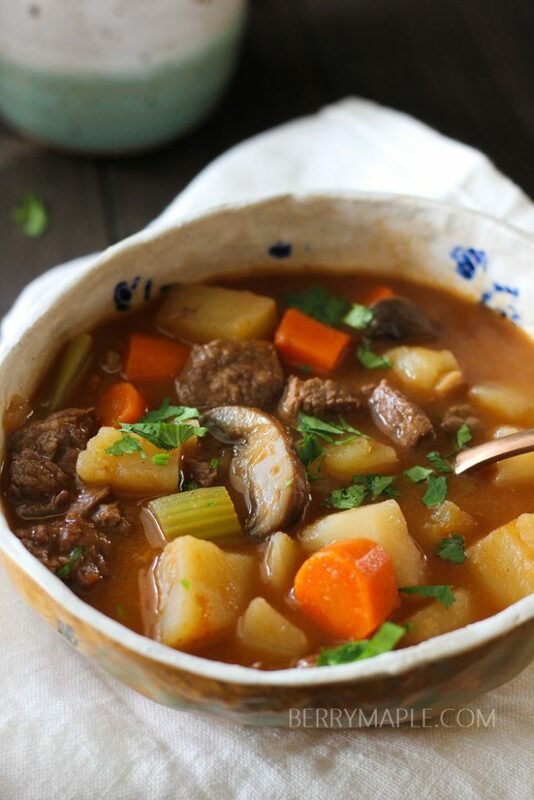 Thick, delicious and absolutely comforting old fashioned beef and vegetable soup in Instant pot will comfort you on a cold day! Almost as thick as a stew! For this delicious soup i want to thank a pressure cooker i have- an Instant Pot! So quick, and the meat is so tender, like it was cooked for hours, but in fact it was just 20 minutes! Cooked to perfection- a comforting treat for you and your family on a cold day. I wish it was snowy here, in North California! The closest snow destination for us is Lake Tahoe, about 3-4 hours away. I love that place! 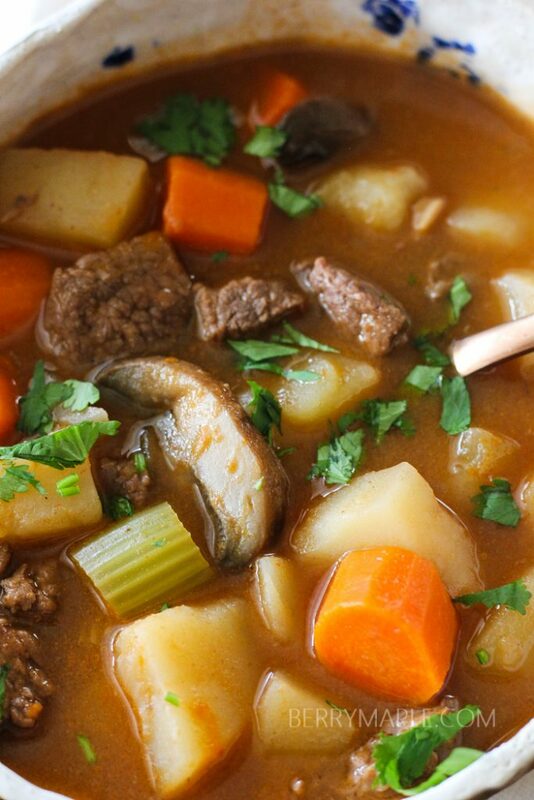 The flavors of this beef and vegetable soup are so comforting. Tender juicy meat bites, delicious veggies and the main part is the broth! Rich, flavorful, amazing! There are a lot of places to buy meat around us. A lot of farms, where the owners offers you a large variety of fresh beef. You can even buy a half of a cow and share it between friends. So much cheaper! Sometimes we buy meat at Costco. Not same quality as fresh farmed, but hey, so much more affordable! I like to buy in bulk, and then freeze everything in small batches- very handy. When its a cooking day, just get the batch out and defrost it at once. No extra work required! Lately i started to use Butcherbox for my meat purchases. They actually have a deal right now, get 2 FREE Filet Mignons, Bacon & $10 off your first box. Pretty amazing and good value. Instant Pot is an amazing tool for any soup lover. Really! The possibilities are endless. Instant pot chicken noodle soup(classic and kid friendly!). 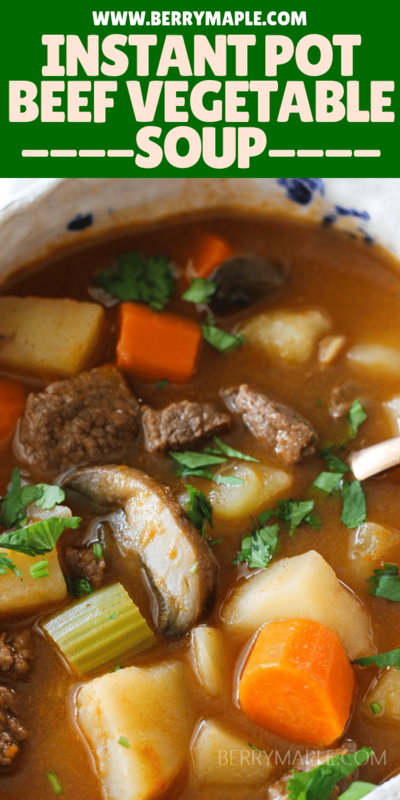 This beef and vegetable stew is easy to make your go to dump freezer meal. Just cut all the ingredients, cube meat (leave aside water, broth and tomato paste, you will add it later). Add them to a gallon size zip lock bag and freeze trying to leave it standing in the freezer. If you will lay the bag flat, it will be a bit complicated to dump it into your Instant Pot because it simply will not it. Once all the ingredients are in the pot, add liquid and cook on SOUP setting for 23 minutes (6 minutes longer then if not from frozen). 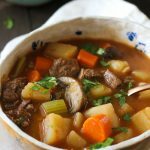 Thick, delicious and absolutely comforting old fashioned beef and vegetable soup in Instant pot will comfort you on a cold day! Turn the saute button on your Instant Pot. Heat 1tbspn of oil until just smoking. Brown the meat and transfer in to a different bowl . In the empty pot heat the rest of the oil and saute mushrooms with onions for 5 minutes. Stir in tomato paste, thyme and garlic and cook for additional 30 seconds. Whisk wine scraping up browned bits, then stir in stock, water, potatoes, carrots, celery and beef. Lock the Instant Pot lid, push on SOUP button and adjust to 17 minutes. Before serving sprinkle some chopped cilantro on top. Want to try this recipe but since I am widowed and kids all on their own, want to freeze soup after making it. Do not like consistency of potatoes after being frozen – do you have any suggestion of other veggies to add? By the way, so glad I got my 6 qt Instant Pot even though I am only one. Have made many soups and chili to freeze in individual servings and even chicken breasts with my Foodsaver. Just what I wanted for these sub-zero days. Quick, simple, tasty, and filling. I have never cooked much with wine. What type of “dry red wine” do you use when you make this recipe? Hi Elaine! Thank you for asking, i usually use Merlo red wine. Thank you Tatiana! First of al what a pretty name. I made the soup and it was very good. I especially liked the light broth. For sure I will make it again. The only seasoning is thyme? No salt or pepper? I just completed adding all ingredients for this soup but have a question. The ingredient list calls for 2 cups of water but directions don’t say to add it. Can you clarify please ? Thank you – can’t wait to try this – it looks and smells amazing! I am so sorry! I forgot to put it in the directions. You need to add water before closing the lid. Going to update it now. This soup looks so good! I need to get an instant pot! I love vegetable beef soup like this. This one looks so flavorful! I don’t have an Instant Pot though. I have an Instant Pot that I don’t use nearly enough. This recipe looks great for the colder days we are getting before it really starts to warm up in Arizona. Definitely adding this to our weekly line up! I still haven’t gotten me an Instant Pot. I will have to get one ASAP so I can try your recipe. Looks good! This is a perfect dish for the cold, dreary weather we are having here in North Carolina. I seriously need to get my hands on an Instant Pot! Even though I don’t eat meat, my family would LOVE this recipe. I am a soupaholic and those pictures have me headed for the kitchen! I actually have a pot of homemade beef stock waiting for me in the fridge. This looks so yummy! We don’t eat meat anymore, but my girls would LOVE this. Especially when it’s cold out. Your pictures are so vibrant. Your beef soup makes me think of the soup my Grandma Ryan made when we were younger. Thank you for this great recipe. That is the perfect winter meal!! I love stew and this one looks easy! I haven’t bought into the instapot yet, but recipes like this are really making me think i need one! Thank you so much for sharing this wonderful recipe. This would be perfect for the cold winter days we have here. I love my instant pot! There is so many things I can do with it! I can’t wait to try this one! It looks SO good! I think this is what I need right now. I’m sick and this kind of soup would totally help me feel better. I keep leaning toward getting an instapot…but I have to clear some things out of my cabinets because I have no room for one at the moment. Oh my goodness how delicious does this look! There is something wonderful about the original old style recipes, they are so filling and hearty. That is fantastic! It’s so perfect for these cold winter days. Time to bust out my Instant Pot! 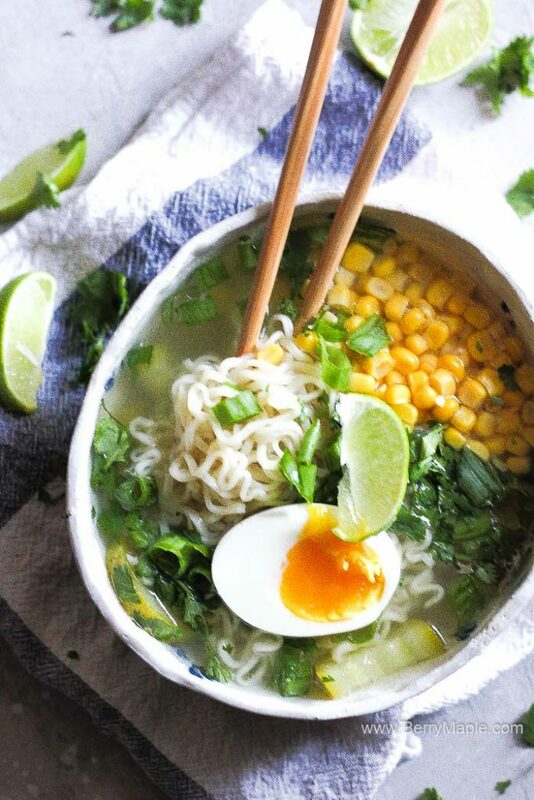 Yum, this looks like amazing comfort food in a bowl. I still don’t have an instant pot and am really starting to think I need one. This is one of my favorite recipes to make in the winter months. I haven’t tried making it an instant pot yet though. Yum! Classic and perfect for wintry days. 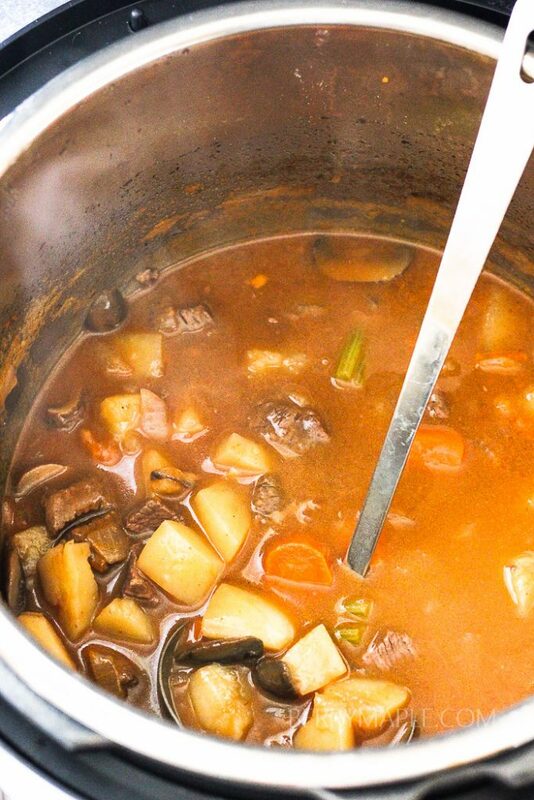 My kids aren’t huge beef fans but really do love a stew/soup like this! This is definitely my husband and youngest’s favorite kind of soup. I love how tender and perfect meat comes out in the IP, I bet it’s delicious in this. I’m so happy this recipe doesn’t have any flour! It’s so hard to find a good stew recipe without it! Thank you! This is exactly what I need in this cold cold weather! So yummy and warming. LOVE!!! I love my Instant Pot and am always looking for new recipes for my family to try out. Thank you! The ultimate comfort food! Looks so so delicious. Simple and comforting. But still quick and easy!! I love this recipe for both reasons!! Looks like pure comfort in a bowl! This would be my husband’s ideal meal! Wow, I think I need to join the instant-pot craze! It’s so nice to have recipes that whip up so quickly! I am *obsessed* with my Instant Pot and have been toying with the idea of converting my family’s favorite beef stew recipe to work in it. Yours looks so good – what a gorgeous, comforting bowl! On a day like today that is something I certainly need!! It’s supposed to be warm and sunny here. HA!! I’m freezing my patootie off and a stew sure would help. It looks delicious!! Nothing better than a big bowl of warm soup in the Winter. Great making this in the Instant pot. OH this reminds me of my mom homemade beef soup with veggies. Can’t believe how awesome this looks. Yum! Old fashioned beef soup is like the gold standard in the U.S. I LOVE this soup, yours looks so delicious, perfect for this crazy weather we have. Thanks for sharing your recipe! That looks like a very hearty and comforting stew. Just what we are craving these days. It reminds me a bit of my mother’s veal ragout. There is nothing quite like homemade soup on a cold winter day. I love the saute feature on the instant pot for getting the meat brown and those lovely bits into the soup for flavor! Thanks for sharing! I love all the big hunks of mushroom in your soup! Pressure-cookers and cold winter days go together so well! A nutritious and tasty meal, made easier and faster by the Instant Pot! A classic made just as delicious, but SO much easier by the Instant Pot. Now that I think of it, that statement kind of applies to my whole life. LOVE this! !